Why the momentum for mangroves? USA - A couple researchers created fake mangroves in Manasota Key to bring back marine life that was lost from development. Along Florida’s coasts are seawalls-- built to prevent the shoreline from eroding. But that defense sometimes means removing natural habitats. Experts are now trying to turn these solid barriers into thriving ecosystems. What? No last word? We welcome your comments and story ideas. March 9th was another sweltering day in southern Thailand. The air was almost wet with humidity, the sun beat down from overhead, and the relentless heat hung around like a blanket. 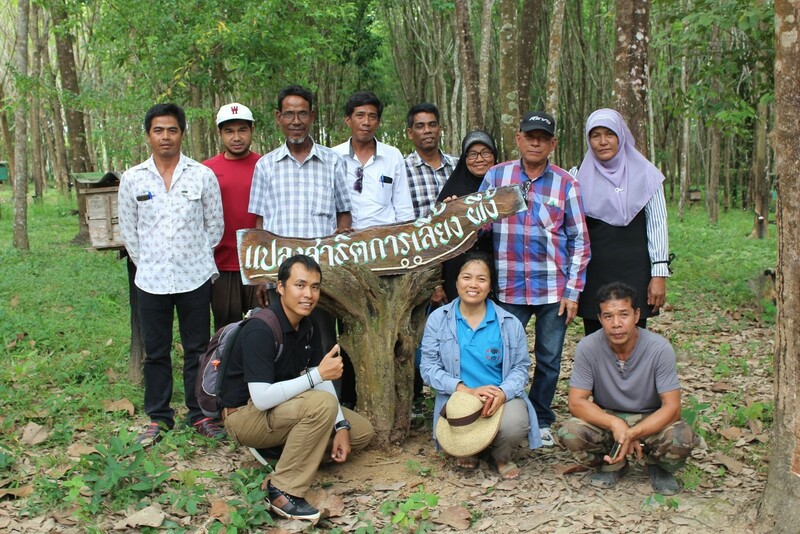 However, the midday temperature did not stop the seven villagers from Ban Thung Yor, Klong Thom, Krabi Province who were exploring the mangrove restoration site at Ban Nai Nang. This was the second stop on a two-day tour of three villages affiliated with Mangrove Action Project (MAP) and funded through Synchronicity Earth of the UK. The tour was set up to highlight the experiences of MAPs participants and share ideas of how to successfully restore their own mangrove area. rubber garden at Ban Nai Nang. March 8th, 2017. The second stop of the day brought the villagers to the heat of mid-day and to the eco village of Ban Nai Nang. Villagers got to meet Mr. Sutee Pankwan ­­­­­­­the chairperson of the villages apiculture group, and discussed how the village has many different groups (crab bank, ecotourism, and apiculture product production) and that all work together and contribute their profits to the conservation group that aids the preservation of the mangroves. Sutee Pankwan highlighted the need to learn and work together and share knowledge to be successful, and told the group that, “working together is the key to our success. We all have different groups in the village, but we always make sure that some of the money we make, goes into the conservation fund. 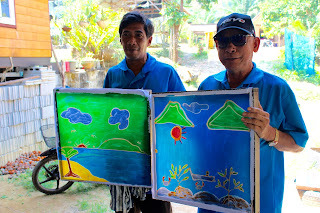 Without nature, our projects would be pointless.” He also shared that the village was trying to register as a community forest, and that they have plans to work on rehabilitating the mangrove area in the coming month. After trying some of the delicious honey and touring the mangrove site, the villagers embarked on the final step of their trip. The tour concluded with an overnight visit to the village of Ban Talae Nok. Villagers here have worked for years to reestablish their mangrove area, and have divided it into two sections- one left to restore naturally, and another with the addition of the planning of Nypa plants that the villagers use for thatch roofs, cigarette rollers, food, and daily life. Villagers of Ban Thung Yor were invited to learn to make batik fabric prints and were taken on a tour of the mangrove area, which has grown a considerable amount since the last time it was visited. 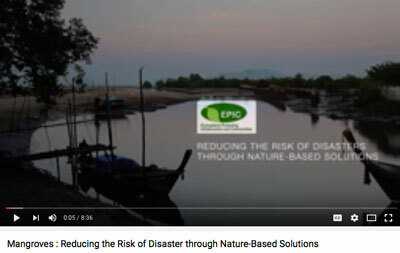 “Our biggest problem was hydrology of the site,” spoke Mr. Ekakarat Cheangyang, “once we got the hydrology fixed, the area grew back quite quickly, and is still growing.” Indeed, the lush green leaves and myriad of crabs, birds, and monkeys are a sure sign of the sites success. at Ban Talae Nok. March 9th, 2017. Upon saying goodbye, and arriving back in Ban Thung Yor, the participants were left with a lot of information and knowledge. Thung Yor village chief, Mr. Raksa Komodkhan said, “Thank you so much for taking us on this trip. We have a lot to think about now and will raise these ideas with our community.” Hopefully after some reflection, they will decide to join the MAP network and make their site the latest addition to the restoration areas directed by MAP. In 1991, 20 hectares of pristine and biodiverse mangroves were cleared in Tiwoho Village, part of Bunaken National Marine Park, as part of a nation-wide program of aquaculture development known as the Blue Revolution, which has resulted in the loss of over 1,000,000 hectares of mangroves nation-wide. The aquaculture venture operated only for a period of 6 months, and the land lay fallow for the next decade. Six attempts to plant mangroves took place over the intervening years, but none of these attempts succeeded, as a result of failure to restore a functional hydrology to the system, which is the limiting factor for successful mangrove rehabilitation. 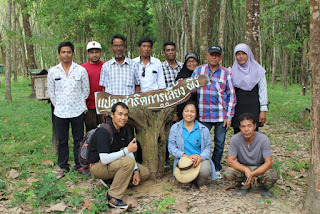 In 2004, the principles of Ecological Mangrove Rehabilitation were applied to the site in a collaboration between villagers, local universities and NGOs, and international ecologists. 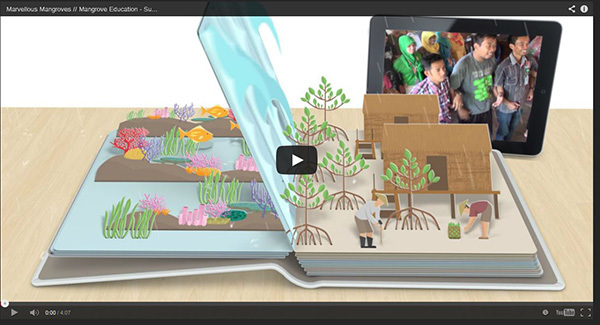 The following pages bring to life this pivotal rehabilitation effort, the first of its kind in Indonesia where communities were enjoined to repair the hydrology of an abandoned shrimp pond complex to promote natural regeneration of mangroves. 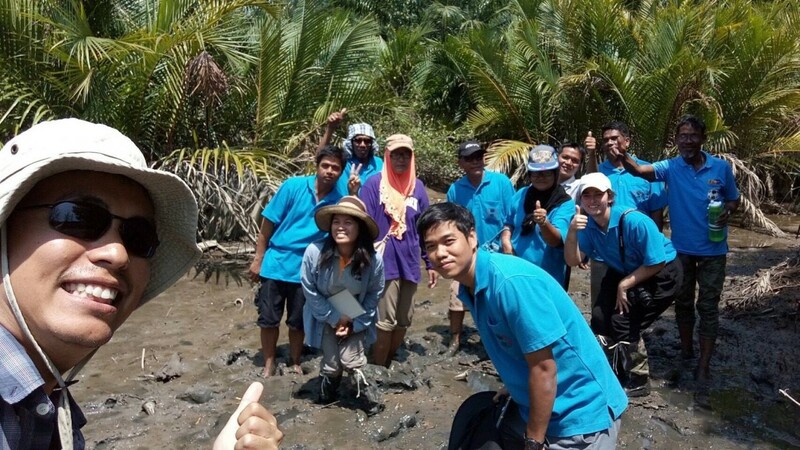 This pilot project has led to the successful rehabilitation of over 2000 hectares of mangroves in other parts of Indonesia, and serves as an example of collaboration and adaptive management that is changing the way Indonesian practitioners address mangrove restoration. I hope that this email finds you all well and everyone is having an excellent week! My name is Emma McDowell and I am the new Volunteer Intern at MAP. I am from the United States (Vermont), I am currently completing a US Fulbright Grant in Nakhon Si Tammarat, Thailand. As part of my grant I am encouraged to take time to pursue an internship in a field that is of interest to me, and I am so excited to be working at MAP for the next month. I double majored in Environmental Studies and Spanish & Hispanic Studies in university, and am looking to apply for masters programs in Anthropology with an emphasis on Environmental Conservation and Management in the coming year. The past two years I have worked in Costa Rica, Guatemala and Thailand on different environmental and wildlife conservation projects and am excited to learn more at MAP. I am very interested in learning as much as I can about community based conservation projects, mangrove forests, and gaining experience working in the field and the office. I would love to help out in any way that I can, so please to not hesitate to let me know if there is anything I can do to make your jobs easier. I look forward to working with you all and getting to know everyone! Land (and water) grabbing and loss of biodiversity is taking place in the wetlands of Ramsar Site #1000 and the Protected Areas (PAs) of the Gulf of Fonseca, Honduras, mainly due to shrimp aquaculture. The institutions responsible for conserving these ecosystems, such as the Instituto de Conservación Forestal (ICF), the Honduran Forestry Conservation Institute, and Mi Ambiente (MiA), the country’s Energy, Natural Resources, Environment and Mining Ministry, are unable or unwilling to enforce the environmental essence of their statements and those made by the president of Honduras. There are 4 business entrepreneurs in the Gulf in Fonseca who are taking over the wetlands along a large portion of the southern coast. The Spanish transnational corporation’s (owned by Mr. Jaime Soriano and managed by countryman Antonio Cano) shrimp farm El Faro, was the first to violate Decree 5-99-e of the Declaration of Protected Areas (PA) in 2000 and destroyed about 100 hectares of the PA and Ramsar Site La Berbería, along with the acquiescence of state officials and the endorsement of the government’s forces. The actual offense was committed with impunity, and now the rest of La Berbería is under threat of destruction. Complaints of Cano’s actions reached the ICF and MiA, but they failed in their duty. The original El Faro Shrimp Farm colapsed and new farms expanded on tens of hectares in La Berbería; this time with the complicity of some fishermen and the sad silence of the NGO that was once a proprietor of its declaration as a protected area. On February 14, 2017, the complaint about this ecocide was formally presented, but the ICF and MiA remained silent. On February 15, the newspaper El Heraldo published the headline: “The European Union can RESTRICT ACCESS TO SHRIMP FOR MANGROVE LOGGING". The article mentions other cases of protected areas being grabbed and converted to shrimp farms. Almost immediately, on February 17, MiA retorts in El Heraldo, “Environment Ministry would fine SHRIMP FARMERS WHO HAVE DESTROYED PROTECTED AREAS”. In this regard, it should be noted that if the fine does not include the recovery and restoration of the intervention area, it can be perceived as mockery and complicity. To worsen the situation of the official environmental policy, the digital journal Criterio writes "EUROPEAN PARLIAMENTARY REQUESTS END OF PARTNERSHIP AGREEMENT BETWEEN EUROPEAN UNION AND HONDURAS”. This was presented on the anniversary of the murder of environmentalist Bertha Cáceres and also proposes cutting off bilateral aid to the Honduran state, particularly in the Eurojustice program. In response to this threat, it should become a priority to truly protect the environment, to do justice to those who gave their lives in the fight for the conservation of territories and to protect other environmentalists exposed to the threat of extractive companies. Of the 3 Goldman Prize winners in Honduras who were recognized internationally for their environmental struggle, one of them escaped the country, another was killed (Bertha), and only one remains. Through the mangrove restoration project in Amuay, led by AEPA FALCÓN, the Small Grants Program of the Global Environment Facility Venezuela, has sought to recognize the role of fisherwomen/. 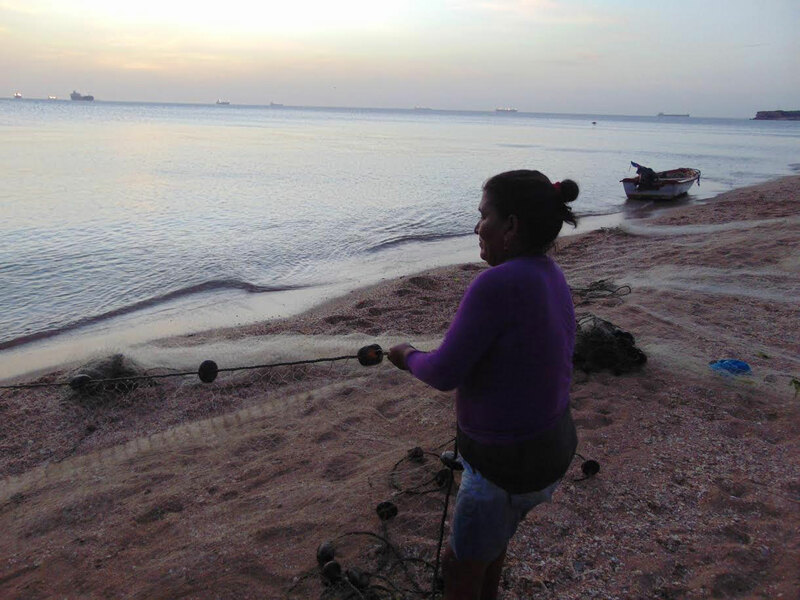 For the first time in Venezuela, seven fisher-women from Paraguaná have been recognized by the Environmental Protection Association (AEPA Falcon), a non governmental environmental organization that is governed by the United Nations. The event, called ”Meeting of Fisher Women”, is aimed at enhancing the role of women in fishing, thus breaking with the norms that artisanal fishing in Venezuela. The award recognizes that their production and efforts are no longer solely relegated to men and shows that females are now being seen within this ancestral practice and play a crucial role in society. The meeting was attended by regional authorities, including the Legislative Council member Falcón (CLEF) Daicis López, Falcón Ombudsman Edisoi Sandoval, Los Taques councilor Ronny Falcón, the chronicler of Los Taques Jesus Muñoz Freites, representatives of the Regional Comptroller, Ministry of Fisheries, Unamujer and delegates of CONPPA Tío Pedro from the community of El Supí. During the event, the first fisherwoman of Amuay given special recognition was Carmen Benita Sánchez, who on March 8 turns 100 years old, and has established an example of the struggle and work fisherwomen have earned. Also honored were Juana Valbuena (86), Juana Sánchez (86), María Ramona Sánchez (78) and Deisy Frontado (49) who each received well-deserved awards as well. Engineer Henderson Colina, a general coordinator of AEPA Falcón, said that this recognition aligns with the goals of the group, and its differentiating factor in other communities was the leading role of women in atisinal fishing and the community reflects this participation. "We are sure that this is only the first meeting to empower the women's experiences with other communities from other latitudes. We are planning a 2018 exchange with institutions in Brazil, where women play an important and even more active role than in Venezuela. In fact, the change in cultural attitudes towards female fishers is in our country, because in other nations women are more organized and accepted for their roles. For example, in Brazil there is the council of artisanal fishers within the Mangrove Network, led by women," Henderson Colina said. He stressed that this activity is part of n ambitious project. "The Mangrove ecosystem source of food sovereignty for the community of Amuay, (chosen by the Small Grants Program of the United Nations system in 2015) its first phase was based on the restoration of the mangrove, and recovery of the water system for its regeneration. This recognition, in the framework of achieving sustainable livelihoods is in line with the United Nations Global Agenda for 2015-2030, which includes 17 sustainable development goals."